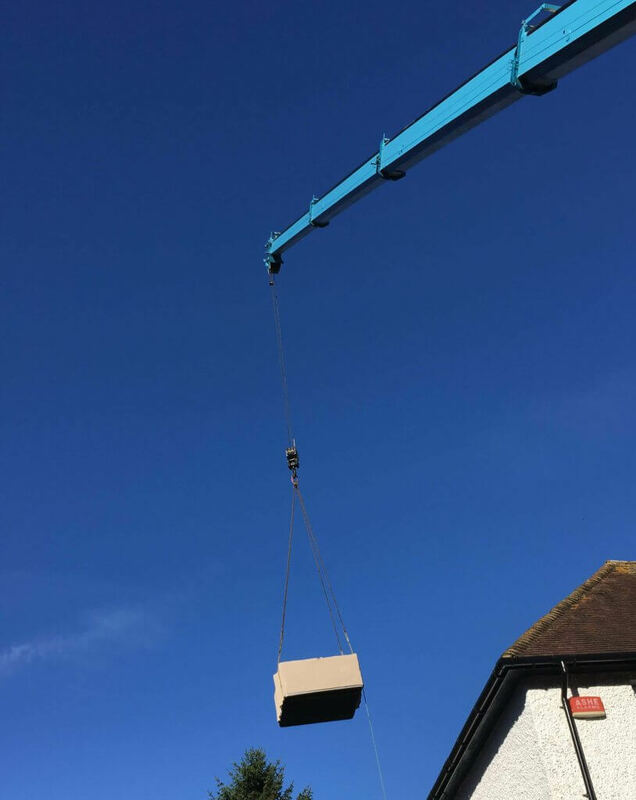 At Pure Garden, we offer Hot Tub and Spa relocation whether it’s a brand new tub, you’re moving house or you’ve purchased a used tub from Facebook or eBay we can help. We use industry-specific equipment to ensure the safe and effective move of your hot tub from one location to another. Simply get in touch with us and we’ll ask you to send us some information and we’ll give you a quote if your happy with the quote then we’ll get busy arranging the required services for you. Can you take care of everything for me? Yes absolutely! When it comes to the collection, delivery and the siting of your new or even existing hot tub we can take care of the entire process for you. 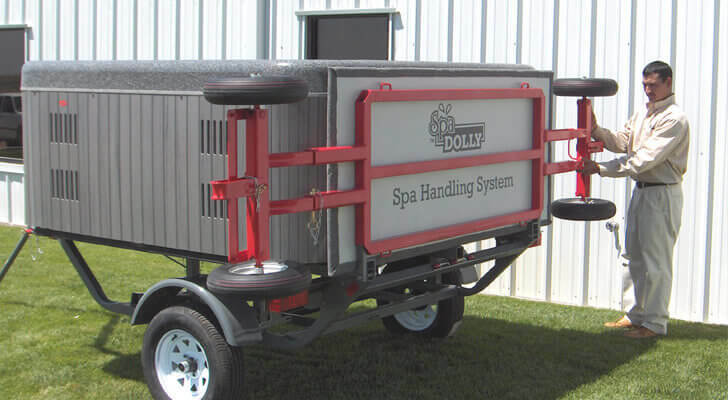 We use the USA manufactured “Spa Dolly” system and trailer, we also use a Spa Wedge for the safe and controlled lifting and lowering of your tub into place. How do you safely lift the Hot Tub on its side? If we’ve not had our Weetabix, we have something called a Spa Wedge. This is an inflatable piece of kit which is placed under the hot tub and inflated, lifting the spa to the balance point and/or onto the Spa Dolly. Product and Public Liability Insurance to the value of £2,500,000 – This covers you and us from the kerbside to your garden for damage to you or your home. Property in Transit Insurance to the value of £10,000 – This covers your tub while on the back of our trailer. What areas are you able to offer this service? We like to stay in Kent ideally but do cover the southeast of England and further if required. For relocations from Kent to other parts of the UK and from anywhere in the UK back to Kent is no problem at all and quite normal, but we would be unable to move your tub from Leeds to Birmingham for example. Thanet and the surrounding areas. How Much do relocation and delivery cost? Standard delivery and relocation start from £195 (including VAT) within the CT18 – CT21 postcode areas. Please measure access points if they are tight and be sure to account for drain pipes, gas and electric boxes, gutters, gateways, etc. If your relocation is complex then we may need to do a site visit or visits prior to offering you a quote. Can you supply a Hi-Ab and/or Crain service? We use third-party contractors for these more specialist services, but we arrange all that for you making the entire process stress free and simple. Craning and Hi-Ab prices can vary depending on area and road you are located and accessiblility. Prices will be anything from £200-£1000 on average but can be more if you’re on a major road. It’s best to get this quote firmed up prior to booking anything. Below is a list of important things to consider for hot tub delivery access. We allow 45 minutes for the pickup and 45 minutes for the drop-off. 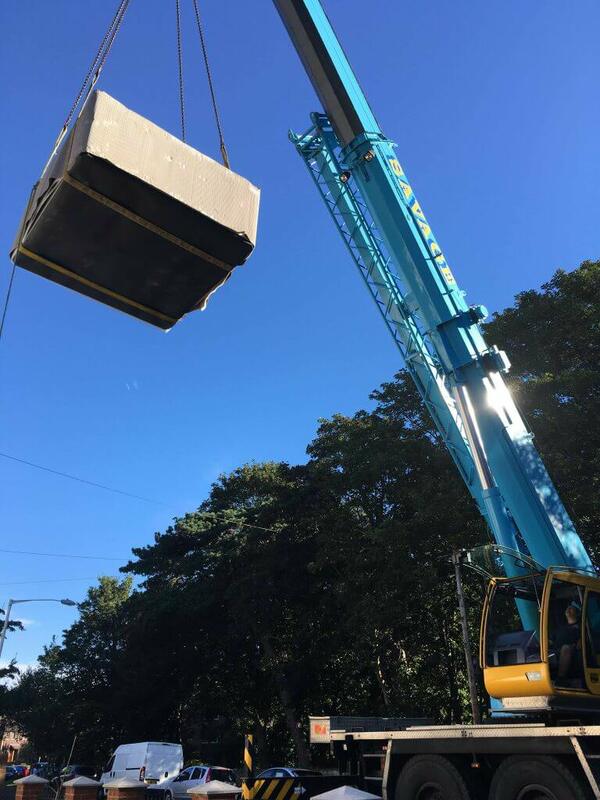 If it runs over this due to a problem with the access or lateness of cranes you will be charged at £40 per hour for the times spent onsite waiting. Dimensions are critical and there must be sufficient allowance for the height and width of the spa on the Spa Kart. Please remember that the tub is moved on its side. It is up to the customer to remove the spa from sunken decking (we will not be responsible for removing the spa). There must be at least 1.2 meters clearance around the spa to allow the team to tip the spa into position. 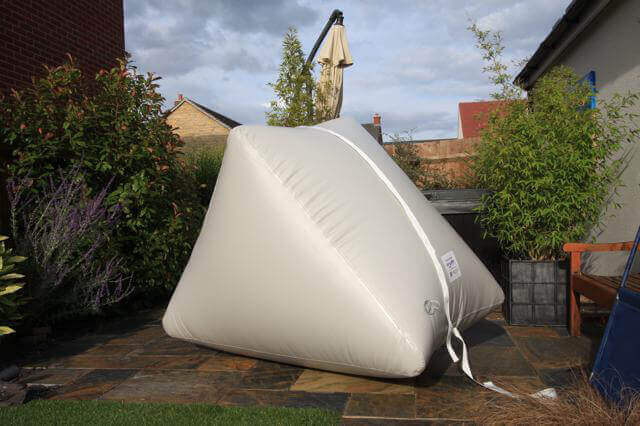 Please allow sufficient height for the spa to be tipped on its side, gazebos or spa roofing must be removed prior to delivery – if required. Ideally we require clear level access over hard ground. Soft ground and one or two small steps can be overcome by using boards in advance. Fence panels must be removed before we arrive. Failure to do this may add to labour costs. Large steps, inclines, etc. can cause problems if we are not made fully aware of them prior to providing a quote for the job. If the tub needs to be taken off the trolley to negotiate in a difficult area like steps, then there may be additional costs for the labour involved. When checking the access route beware of trees and shrub branches, gate arches, low roof eaves, drain pipes, central heating flues, outside taps and overhanging power cables, narrowing access. Also, remember to check there is adequate turning space in the corners. Remember our spa kart is 3.5m in length so a 90-degree corner would be impossible. However, we may use alternative methods for tight spaces. We cannot move or be responsible for any tub that is in a state of disrepair or dilapidation to such an extent that it’s not safe to do so (due to health and safety) we will not be able to relocate or dispose of any spa found to be in such conditions. If you cancel your job within 48 hours of commencement (2 working days) we reserve the right to retain any deposit. Cancellation under 24 hours we reserve the right to invoice for the full amount of the Job. You will have 7 days to pay this from date invoiced. Cancellation after booking may incur an admin fee of £42 at our discretion. This is a contractual agreement and by paying us the deposit you are entering the agreement and bound by the terms. Please get in touch! We’re happy to answer any questions you have about got tub delivery, relocation or anything else.